Water is the most important molecule on our planet. Viewed from space, one of the most striking features of our planet is the water, in both liquid and frozen forms, that covers approximately 75% of the Earth’s surface. It is the only known substance that can naturally exist as a gas, a liquid, and solid within the relatively small range of air temperatures and pressures found at the Earth’s surface. In all, the Earth’s water content is about 1.39 billion cubic kilometers , with the bulk of it, about 96.5%, being in the global oceans. As for the rest, approximately 1.7% is stored in the polar icecaps, glaciers, and permanent snow, and another 1.7% is stored in groundwater, lakes, rivers, streams, and soil. 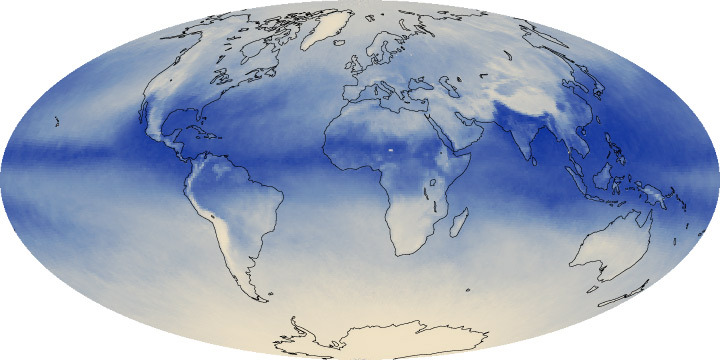 Only a thousandth of 1% of the water on Earth exists as water vapor in the atmosphere. The volume of all water would be about 332.5 million cubic miles (mi3), or 1,386 million cubic kilometers (km3). A cubic mile of water equals more than 1.1 trillion gallons. A cubic kilometer of water equals about 264 billion gallons. • About 3,100 mi3 (12,900 km3) of water, mostly in the form of water vapor, is in the atmosphere at any one time. If it all fell as precipitation at once, the Earth would be covered with only about 1 inch of water. The 48 contiguous United States receives a total volume of about 4 mi3 (17.7 km3) of precipitation each day. • Each day, 280 mi3 (1,170 km3)of water evaporate or transpire into the atmosphere. • If all of the world's water was poured on the United States, it would cover the land to a depth of 90 miles (145 kilometers). • Of the freshwater on Earth, much more is stored in the ground than is available in lakes and rivers. More than 2,000,000 mi3 (8,400,000 km3)of freshwater is stored in the Earth, most within one-half mile of the surface. 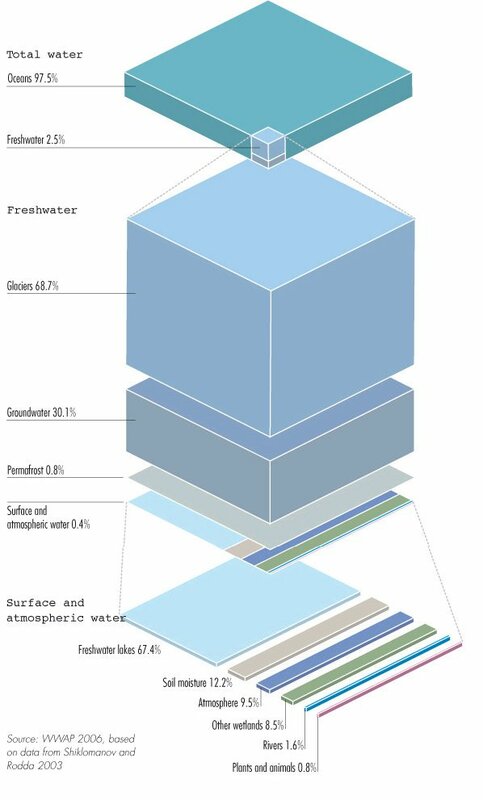 But, if you really want to find freshwater, the most is stored in the 7,000,000 mi3 (29,200,000 km3) of water found in glaciers and icecaps, mainly in the polar regions and in Greenland. Water's chemical description is H2O, that is one atom of oxygen bound to two atoms of hydrogen. The hydrogen atoms are "attached" to one side of the oxygen atom, resulting in a water molecule having a positive charge on the side where the hydrogen atoms are and a negative charge on the other side, where the oxygen atom is. Since opposite electrical charges attract, water molecules tend to attract each other, making water kind of "sticky." The side with the hydrogen atoms (positive charge) attracts the oxygen side (negative charge) of a different water molecule. Water freezes at 32o Fahrenheit (F) and boils at 212o F (at sea level, but 186.4° at 14,000 feet). In fact, water's freezing and boiling points are the baseline with which temperature is measured: 0o on the Celsius scale is water's freezing point, and 100o is water's boiling point. Water is unusual in that the solid form, ice, is less dense than the liquid form, which is why ice floats. Water contracts until it reaches 4 C then it expands until it is solid. Solid water is less dense that liquid water because of this. Water has three states. Below freezing water is a solid (ice or snowflakes), between freezing and boiling water is a liquid, and above its boiling point water is a gas. Water changing from solid to liquid is said to be melting. When it changes from liquid to gas it is evaporating. Water changing from gas to liquid is called condensation . Frost formation is when water changes from gas directly to solid form. 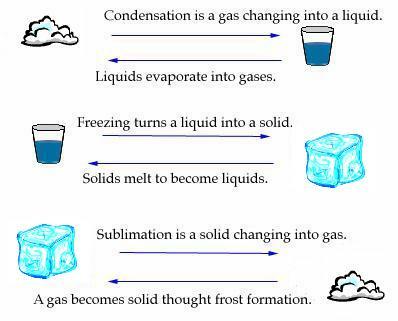 When water changes directly from solid to gas the process is called sublimation. The degree Fahrenheit (°F) non-metric temperature scale was devised and evolved over time so that the freezing and boiling temperatures of water are whole numbers, but not round numbers as in the Celsius temperature scale. boiling point of water 373.15 100. 212.
melting point of ice 273.15 0. 32. For human needs, the amount of freshwater on Earth—for drinking and agriculture—is particularly important. Freshwater exists in lakes, rivers, groundwater, and frozen as snow and ice. Estimates of groundwater are particularly difficult to make, and they vary widely. The total water supply of the world is 326 million cubic miles. A cubic mile of water equals more than one trillion gallons. Of the freshwater on Earth, much more is stored in the ground than is available in lakes and rivers. 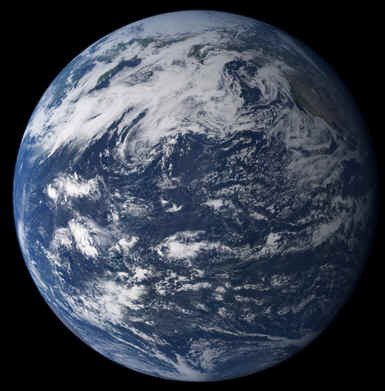 More than 2,000,000 cubic miles of fresh water is stored in the Earth, most within one-half mile of the surface. Contrast that with the 60,000 cubic miles of water stored as fresh water in lakes, inland seas, and rivers. The most is stored in the 7,000,000 cubic miles of water found in glaciers and icecaps, mainly in the polar regions and in Greenland.